The group currently has experts from over 140 jurisdictions and these firms are cutting-edge go-ahead practices that are committed to offering first class advice, with the joint potential to find the right solution for any specific problem and so resolve any legal, financial and tax issues which may arise. So, we at Maddock & Bright IP Law Office are pleased to announce that our firm represented by Mr. Abdelwahab Moustafa has been chosen as the Intellectual Property Lawyer of The Year in Egypt. Legal Comprehensive awards programmers acknowledge the most active and expert advisers from around the world. Legal Comprehensive independently judged to ensure the very best advisers are chosen for each award category. It is a truly global award that merits leading advisers from every corner of the globe. 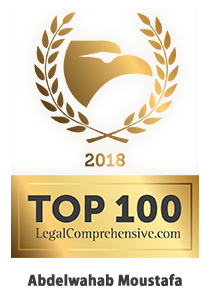 So, we at Maddock & Bright IP Law Office are pleased to announce that Mr. Abdelwahab Moustafa has been chosen as one of the Top 100 Lawyers for 2018. The Lawyers World Country Awards celebrates the very best Lawyers and Law Firms in the Country. Each year they advise their readers on whom we consider being the best Lawyers and Law Firms in their Country. This year, the panels of judges have selected our firm to be a winner within the Lawyers World 2018 Country Awards. So, we at Maddock & Bright IP Law Office are pleased to announce that our firm represented by Mr. Abdelwahab Moustafa has been chosen as the Middle East's IP Law Firm of the Year. Our Firm achieved recognition as one of the top five firms in our respective country in the Patent Lawyer Magazine’s 2018 rankings. So, we at Maddock & Bright IP Law Office are pleased to announce that our firm represented by Mr. Abdelwahab Moustafa has been chosen as One of the Top Five Firms in our Respective Country.